The BaaS Reference Architecture provides common concepts and guidance for the development of concrete BaaS platforms. In particular, the BaaS Information Model facilitates the semantic modelling of devices, functions and data and thus provides a blueprint for the specification and generation of BaaS services. The establishment of a BaaS system follows a service lifecycle model that covers the phases of Design, Development, Engineering, Commissioning, Operation and ITEA Success Story Optimisation. The BaaS platform provides a number of tools and methodologies supporting the first phases of this lifecycle while the BaaS runtime facilitates the capabilities needed to operate a system of BaaS services. A technical management system monitors the services and ensures their proper operation. Building automation engineers benefit from BaaS tools that facilitate easy and flexible modelling, development, engineering and commissioning of services while tenants benefit from enhanced comfort, better customisation of services and energy savings through presence detection and environment awareness. Essentially, the BaaS approach can serve as a blueprint for stakeholders in future BAS ecosystems and provides for promising exploitation options. Project partner BOR Software generated the first direct commercial product from the BaaS results: BEY, a Building Inventory Management tool for commissioning, operating and monitoring BAS. Furthermore, Software Development Services for Smart Environments were created along with consultancy services for IT companies on semantic interoperability and device modelling for Smart Environment Solutions. Five years ago, BOR was not familiar with smart environments but now the company has a strong business in this field. Beginning the project as the smallest SME participant (2 people), now 15 people are working in BaaS-based IoT products and services, a total that could be doubled if the right talented engineers can be found. BaaS gave BOR a fast, high learning curve to convert knowledge into commercial exploitation and new opportunities. The income resulting from the project is estimated at around 1.5 million euros for the period 2017-2020. After BaaS, BOR has established a new division for Smart Environment Engineering releasing commercial products and professional services. Through this, BOR has been participating in commercial projects. Also, spin-off companies were recently founded under the guidance of BOR, inspired by the gained BaaS knowledge and its IoT focus (IOTIQ GmbH, www.iotiq.de, and ERSTE Software Ltd., www.ersteyazilim.com). Fokus Fraunhofer is engaged in a joint project, WaveSave, on the adequate dimensioning and optimal operation of building energy systems. Funded by the German Federal Ministry for Economic Affairs and Energy, this research and development project is developing two coordinated tools: a modelling, simulation and optimisation system with extensible model and data libraries as well as application-specific, customisable optimisation targets for the dimensioning of building energy systems adequate to their future usages; a self-adaptive management system to support the operation of building energy systems via building service management systems using optimisation techniques based on predictions of energy demand and generation (e.g. using PV systems). The tools will be practically evaluated and demonstrated on the rooftop building of the Berlin University of the Arts. Kieback&Peter GmbH & Co. KG is developing an Integrated Building Management System (iBMS). IBMS integrates all the technical equipment (like HVAC, IT, access) of buildings, their substance and planning models around the operational efficiency, economy, user comfort, productivity as well as safety and reliability of buildings. It enables the joint management of several buildings (e.g. via Internet), the secure exchange of data and communication with infrastructure systems (e.g. Smart Grid). Independent use case-related applications can be installed, customised and uninstalled in the iBMS at any time. The data obtained in the system (sensor, actuator and application-calculated data) are supplemented by semantic and location-related information and are available to all applications. iBMS can be exploited by third-party applications and provides the basic energy and building management functions. It can be extended to value-added services such as optimisation, forecasting, billing, maintenance, security, etc. Prodevelop provided the prototype 3D Web Visualisation for Real-Time Maintenance of Smart Buildings in BaaS. This has been successfully scaled to Smart City scenarios, namely for 3D real-time reconstruction from wearable sensors of buildings during emergency operations and for a Smart City 3D simulation and monitoring platform. Prodevelop is currently transferring these technological advances to a geo-smart product in the port sector. 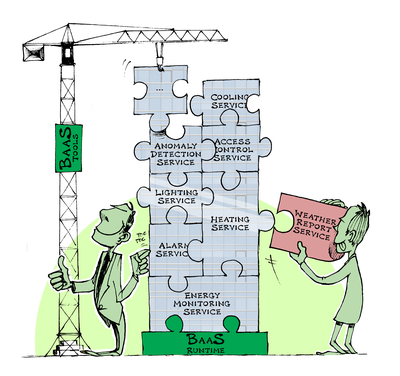 Siemens has taken advantage of the results of the BaaS project for supporting the development of new BACnet standards (a data communication protocol for Building Automation and Control networks) together with Siemens Building Technologies. Ideas from the BaaS project have contributed to the Technical Working Group of the Fairhair Alliance, launched in 2015, to adopt and develop IoT technologies for Building Automation Systems, with Siemens, Philips and NXP as members. The BaaS Demonstrator has been shown many times to various Siemens business units for the internal dissemination of BaaS results and has gained several internal research and development projects that continue the semantic approach started in BaaS. In particular, a novel engineering methodology called Semantic-Driven Engineering (SDE) needed as an enabler for creating large-scale IoT deployments, such as those targeted by Siemens’ IoT operating system MindSphere, has been proposed and will be further developed. TWT is exploiting the semantic framework developed from the BaaS Information model to establish a so-called Smart Data Hub, a generic interface for individualised user queries to various data sources that will eventually connect enterprise applications with underlying data management systems. This has already been applied in a couple of customer projects plus there are a further two research projects to continue development of these software solutions. Customers have indicated that they like the natural language search to find the required information. The University of Rostock, whose focus in BaaS was security protocols of building automation, like thread modelling in the commissioning phase of building automation systems and the relevant specific semantics, has published a survey on information modelling and ontologies in building automation in collaboration with Kieback & Peter in which all existing semantic definitions of building automation devices and data have been investigated. Furthermore, its CoAP (Constrained Application Protocol) stack for IoT has been extended to ‘jCoAP’, part of BaaS technologies, and is available as open source. . This pre-BaaS software was used and extended in and through the BaaS project and URO has integrated BaaS technologies in an IoT laboratory that combines both building automation and medical systems in one place to exploit the cross-domain features of BaaS-technologies. BaaS knowledge feeds into the teaching on IoT and related subjects and has a strong impact on the research domain, with new research projects being generated and a PhD and Master thesis being completed within the project period. Some significant (academic) BaaS follow-up is also anticipated at Istanbul Technical University (ITU): nine graduation projects were completed and seven MSc theses written and based on project activities. ITU is currently awaiting the evaluation of a project proposal that targets system design and implementation of a secure IoT network and has been organising special IoT sessions for two years at ELECO, the International Conference on Electrical and Electronics Engineering. While more time is still required for some of the exploitation opportunities of BaaS technologies to mature, the examples above reveal that this potential is already being utilised and that more prospects of doing so are in the pipeline.